PROTEST, LOS ANGELES: Israeli Consulate on June 29, 4 pm_PROTEST, LONDON: Parliament Square on June 30, 5:30 pm _PROTEST, VIENNA: Israeli Embassy, June 30, 11 am_FREE POSTER (above): Download, print, and display publicly! 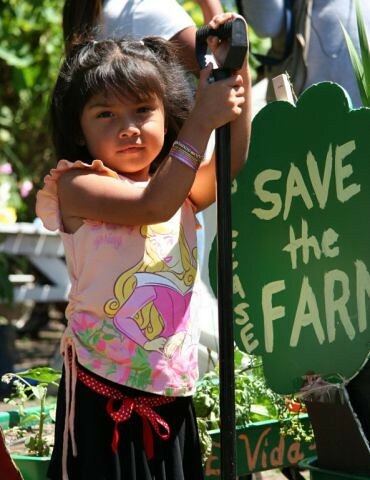 Gathering to save the farm, in addition to the farmers themselves, are activists, artists, movie stars, environmentalists, organic gardeners, lawyers, teachers, union members, musicians, poets, hip hop artists, old hippies, new immigrants, healers, mothers, fathers, grandparents, children. Why does it mean so much to us? What would it mean to lose the farm? If we lose the farm we will have lost more of what makes us human, whole, connected. Certainly it is the farmers themselves who have the most to lose, but the loss is greater than the sum of 350 family plots. The vigils, letters, donations, phone calls, tree sitters, artists and ordinary seeds stand in marked contrast to the gray blight of the surrounding area: corporate greed, police force, backroom deals and government official worried more about campaign contributions, corporate kick backs and future six figure job opportunities. If there ever were an argument for the use of eminent domain it would be the purchase of the farm for its perpetuity. The farm is green in a sea of gray. The farm is classroom and laboratory: a germinal history, a museum of sustainable indigenous agriculture, of innovative city planning. We all have much to gain from saving this farm, much to lose in its destruction. A victory could pave the way for demands for more green space. We should insist that public parks plant fruit trees instead of ornamentals so that as the tree grows, the community might feed themselves. We must insist on pesticide, herbicide free landscaping in all city parks. We must demand that for every seizure of homes under eminent domain, to build a new corporate center, shopping mall, Walmart, football stadium, and prison that ten community gardens be erected. 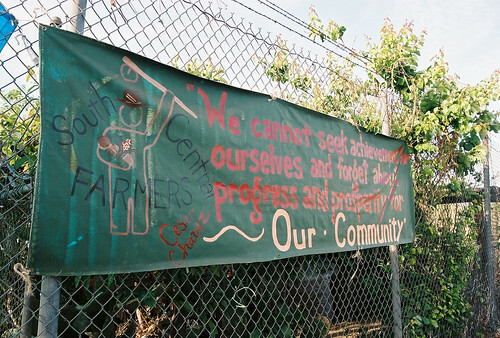 We must insist upon the seizure of blighted land for the construction of community gardens: box stores that came, profited and left, empty lots that collect junkies’ needles, old tires, industrial waste. 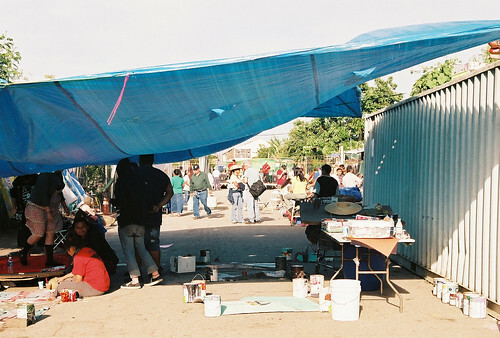 The artists; adults and children, students from as far away as New Mexico, gather under a tarp as bandas play rancheros and Anna Kunkin prepares to dance to the Enzo’s drum beat. Come down. Make the trip. They need you at the farm, every evening at 7 pm, but also during the day. Destroying this treasure should not be easy for the beasts of industry, the captains of capital. Stand down the helicopters and the threat of eviction. Make a donation to the farm in the hope that it isn’t too late; it isn’t too late. The farm breathes, the farm lives, the farm stands. It stands in defiance of corporate greed. 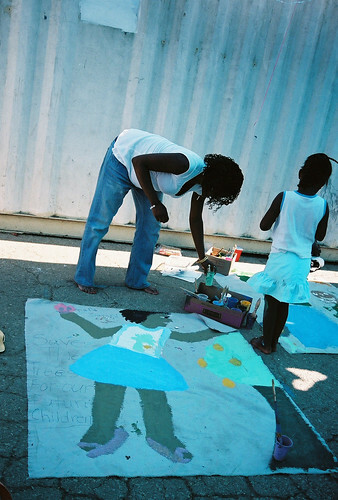 It stands for collective memory: for heirloom seeds, for collectivity, collaboration. 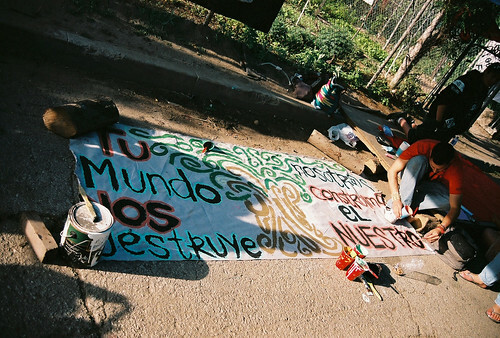 It stands in the way of bulldozers and greed and oppression. It stands for justice, hope, the future, the children. 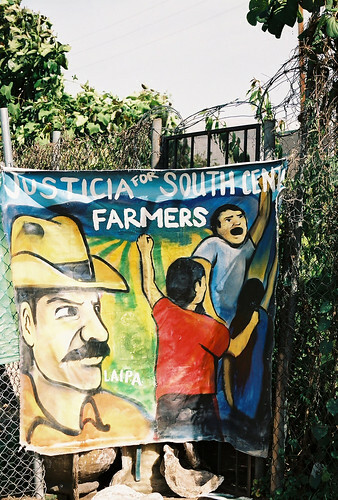 The farm is located at 41st and Alameda in the heart of Los Angeles’ industrial and warehouse blight. Go before it’s too late. Go now. If we win, we win a new path in city planning, the ground for more demands for more green space. If we lose, we lose seed, hope, green space, and we lose ground, not only the dirt, but political ground in the fight for sustainable use of public land, or the privatization of public land for individual and corporate greed. 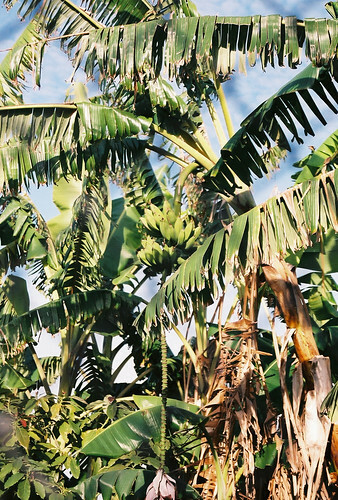 Go now to bear witness to the wonder that is the farm: thirty foot high walnut trees, ten year old banana trees, sugar cane, corn, nopales, children growing food in the shadows and footsteps of their grandparents. Go to save it. Go to see for yourself the treasure of the farm. The richness of the soil, the abundance of fruit, vegetable. This is wealth. This is wealth! 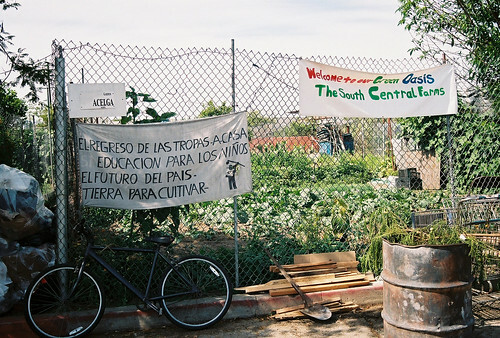 From the olive fields of Palestine to the milpa of South Central Los Angeles; the land belongs to those who work it, love it, tend to it, sustain it as it sustains them. All photos are ©2006 Emma Rosenthal All Rights Reserved. Permission must be received to publish and distribute these photos. Tu mundo nos destruye. 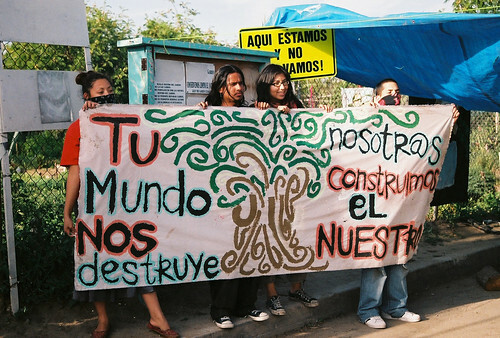 Nosotros construimos el nuestro I_(Your world is destroying us. We will construct our own! Parade at Venice Beach boardwalk, and its gonna have some flavor so dont miss this. The farmers market will be goin off with food, music, arts activities, etc…. water, whistles, noisemakers, tambourines, etc. Well be gathering at 1pm in the parking lot of the Venice Abbot Kinney Memorial Library, 501 S. Venice Blvd., Venice, CA 90291. Well begin the parade at 2pm walking down S. Venice Blvd toward the Boardwalk. 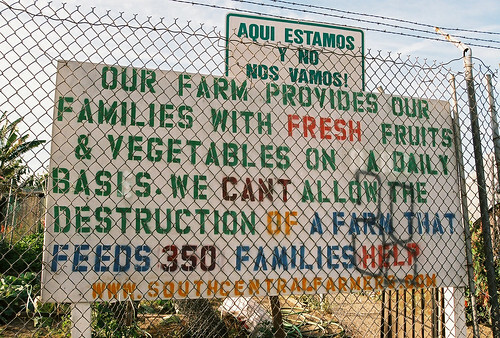 your support for the South Central Farmers!!!!! Not the Last Word on The Farm! 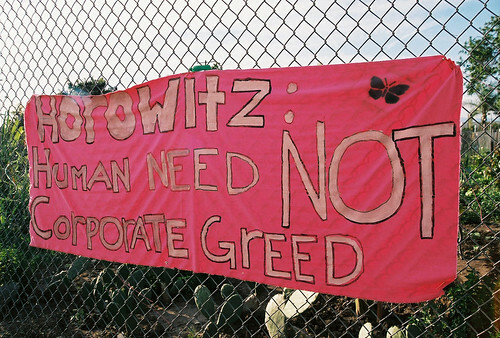 The full 16 million dollars ransom money for the farm was raised, a mere 11 million dollar profit for developer Horowitz, from the 5 million dollars with which he bought the farm from the city. Such greed. Such greed! What reparations are due! What wealth we will have to redistribute! SC FARM: What to do!!!!!! there’s a form there, with email addresses for all city officials. This police action, corporate greed, land grab, cannot go unanswered. There will be a price to be paid for this destruction. The resistance of ordinary seeds!!!!! 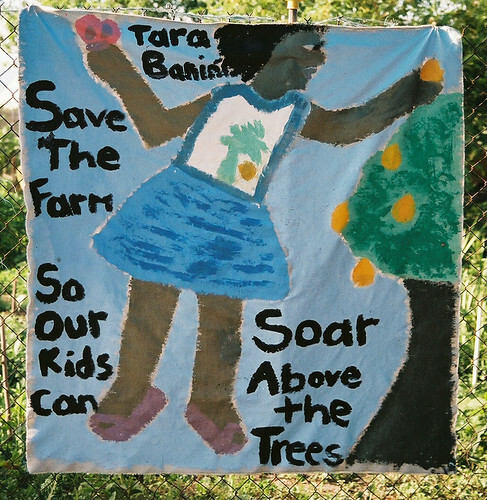 STOP THE EVICTION!_SAVE THE FARM! What follows is an important editorial in light of Israel’s brutal attack on families on a picnic by the sea in Gaza. He refers to war crimes and international law. I would like to add the following: the international (U.N.) definition of genocide, written after WWII by Rafael Lemkin, a Polish Jewish lawyer and survivor of genocide. I detest the word ethnic cleansing. As if genocide were an act of purification (I have similar dissatisfaction with the word holocaust.– a burnt offering of purification to God.) There is nothing sacred or purifying about mass murder. (Such terminology actually implies that the perpetrators are the priests in these cleansing rituals!) If one includes the number of Palestinian children, held in Israeli prisons, without education, health care, family contact or legal representation, Israel meets all five criteria for genocide. 6/1 Urgent Updates! Sheriffs at South Central Farm! Sherrifs met with farmers today, said they need to get out, and they (the sherrif’s) will be coming soon. 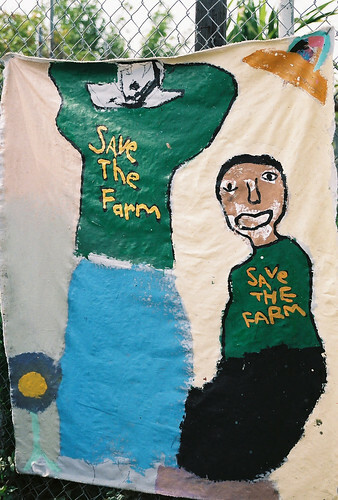 Calling all those in solidarity with tha farm out TONITE tonite TONITE outside or inside the farm! coming from 10 frwy, exit alameda and go south roughly 2 miles, farm on right hand side.